In May, the Insulation Industry International Apprentice and Training Fund (IIIATF) held a four-day Infection Control Risk Assessment (ICRA) worker trainthe-trainer course. The class was taught by Gary Gustafson and Steve Surtees from CPWR: The Center for Construction Research and Training. The IIIATF is dedicated to training and keeping all Local JATCs educated and up-to-date with training enhancement possibilities. This train-the-trainer course allows participants to train their Local membership in both the CPWR 8-hour ICRA Awareness Course and the 24-hour ICRA Worker Course. “This ICRA worker train-the-trainer is the next step in what these health care facilities are looking for in the workers who engage in construction activities on their properties” said HFIAW Local 17 Training Coordinator Robert McGuckin. 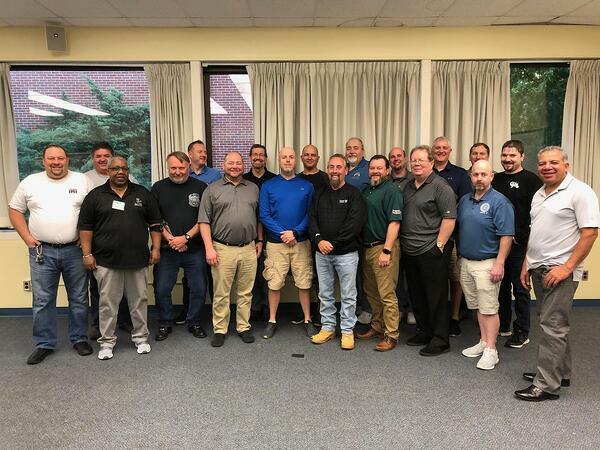 “The Building Trades and CPWR put this program together, so each craft has the ability to perform their work under the ICRA guidelines.” McGuckin praised the quality training and continued dedication of the IIIATF to have instructors from across North America provide training to members and contractors when needed. Wade Edwards, Kevin Meagher and Doug Ripple from Local 207.